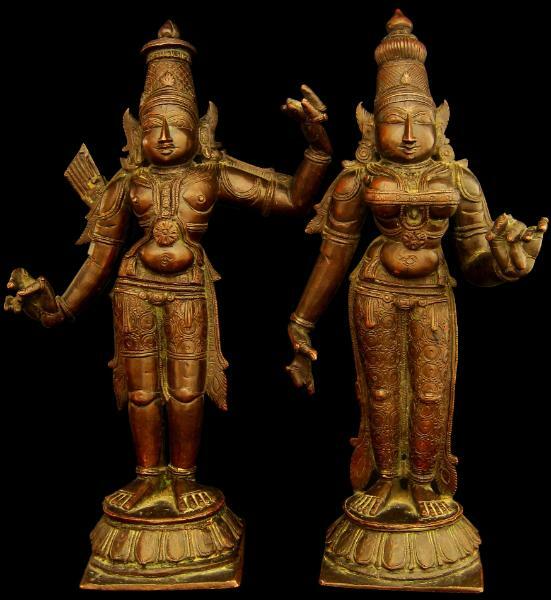 These large, finely cast matching figures of Rama and his consort Sita are elaborately attired in jewellery including prominent finger rings, elaborate ear pieces, beautifully embellished dhotis and tall crowns topped by lotus bud finials. makhara head, the arrows issuing from its mouth. Sita has a long plait of hair down her back over which is cast a five-headed cobra. She held a lotus bud in her left hand (now missing). Both stand on lotus petal platforms. Rama, the seventh incarnation of Vishnu, is a relatively minor deity whose task was to kill a demon king who held his wife captive. But from this story, Rama has entered into the mainstream of Indian mythology and is a major figure in Indian epic poetry, particularly in the Mahabharata and the Ramayana.